This spring, exiting the Stockholm-Arlanda airport, I found myself in a hall which enthusiastically proclaimed, “Welcome to Sweden!” From its walls, huge portraits of the country’s greatest cultural exports greeted me, head shot after head shot. There were actors and directors (Greta Garbo, Ingrid Bergman, Ingmar Bergman), austere portraits of authors (Astrid Lindgren, August Strindberg), and, in 1970s color, ABBA under disco lights, and Bjorn Borg, whacking a tennis ball. 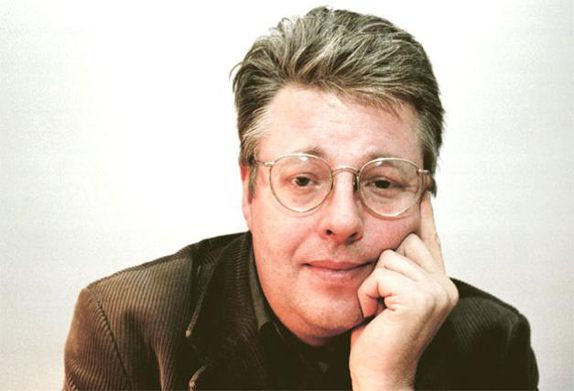 At the end of this procession, as if its grand finale, was a full-body photograph of Stieg Larsson. His head rested on his hand, in a position not unlike that of Rodin’s thinker. It’s a familiar photograph, the same one that appears on the back of each of his books: The Girl with the Dragon Tattoo, The Girl who Played with Fire, and The Girl who Kicked the Hornet’s Nest.